The award winning Esperanza High School Jazz Ensemble is available for hire through the Esperanza Entertainment Unit Boosters and is an excellent choice for parties, receptions and other special events. The complete eighteen piece band offers a variety of classic jazz and swing tunes with a big band sound. The band is a frequent award winner at regional festivals and has competed nationally at the Essentially Ellington competition sponsored by Jazz at Lincoln Center in New York. Your guests are guaranteed to be impressed with the talent of these young musicians. Bring the joy of live music to any special event while helping to support our program! These kids can SWING! 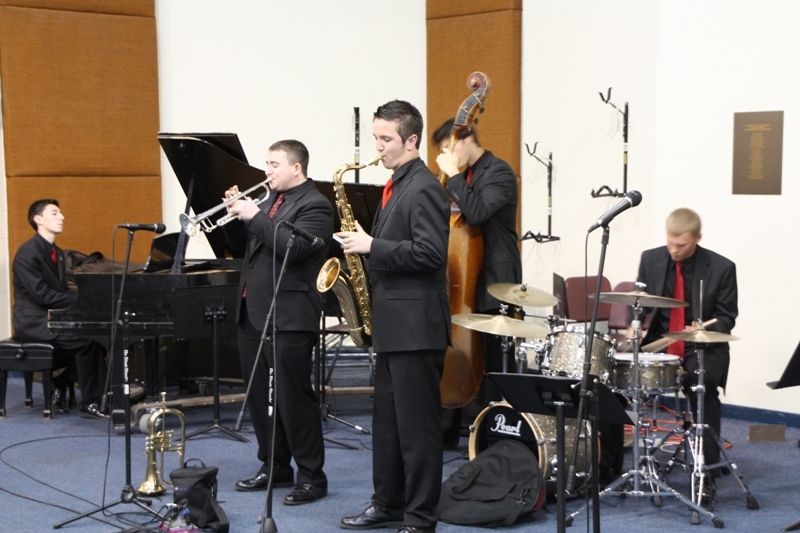 Depending on your event a Jazz Combo may be a good option for you. Combos come in a variety of configurations and sizes but can be formed from three members on up. A combo usually consists of a rhythm section (for example: bass, drums, guitar, and/or piano) together with instrumental soloist(s) such as saxophone, trumpet, or trombone. Every effort will be made to form just the right combo to meet your entertainment need. Duration: The musicians arrive a half-hour before the start time and can play for up to 2 hours, with a 10-minute break between sets. Slightly longer times can be negotiated. The gig should consist of a clearly-defined length of time. Please keep in mind that we cannot ask musicians to stay for breaks of longer duration’s during the event unless negotiated before the event. Cost: A minimum donation of $3,000 dollars is requested for the appearance of the full band complete with a director. A minimum donation of $350 is requested for a three piece combo with an additional $75 dollars for each additional instrument. Our program depends on donations to keep the music playing and yours is very much appreciated. Attire: Dress for the musicians is typically all-black suits with red ties for males and black suits or dresses for females. If your event calls for a less formal look that can be agreed upon at booking. Scheduling: We will make every effort to have the band available or form a combo for your event. Typically, we need to be notified of your event at least one month in advance in order to work out the musician schedules. We cannot schedule any gigs during the school day or during school holidays. All gigs must be in the Orange County area, unless special arrangements are made. At the time of your booking a Gig Coordinator will be assigned to work out event details such as equipment needs, power and space requirements, venue unloading and loading, musician parking, outdoor venues, contact information, and any other event specific requirements. Upon approval of your request the Gig Coordinator will contact you to work out any additional details for your event. Please complete the “Hire the Band” information form (venue and band info) found here and email it to president@ehseu.org. Thank you for your interest in EEU Jazz!